There were 27,217 new condominium apartment sales in the Greater Toronto Area in 2016, a record 34 per cent increase compared to the year before, according to Urbanation Inc.’s recent Q4-2016 market results. Sales in 2016 topped the previous record set in 2011, even though there were fewer new pre-construction launches (18,466 in 2016, versus 28,204 in 2011). In the fourth quarter of 2016, there were 7,422 new condo sales, up 18 per cent over the same period last year. Strong demand combined with a six per cent decline in new launches for the year pushed unsold inventory in development down by 47 per cent from the end of 2015 to 9,932 units, equal to about 4.4 months of supply, a more than 10-year low. New condo sales increased the most in the 905 region, climbing 82 per cent to a high of 8,703 units in 2016 and representing a record 32 per cent share of GTA activity. Sales also increased by 57 per cent to 7,397 units in the outer-416 regions of Etobicoke, Scarborough and North York due to higher new launch activity last year, while in the former City of Toronto, there was a three per cent gain, representing 11,116 units, as launches dropped by 40 per cent. The demand-supply imbalance was most significant in old Toronto, where unsold inventory dropped 57 per cent to 3,503 units, or 3.8 months of supply. The overall average index price for sold units in active development across the GTA increased three per cent year-over-year in Q4-2016 to $598 per square foot. This was impacted by the shift in activity to lower-priced suburban markets last year. Within the former City of Toronto, the average selling price for a condominium unit in projects launched in 2016 reached $746 per square foot, up 14 per cent compared to new launch prices in 2015. At the end of 2016, remaining inventory in new projects in the former City of Toronto was priced at $795 per square foot. The drop in inventory will limit the market’s ability to top the record activity of 2016. Urbanation is forecasting 23,000 new condo apartment sales in 2017, but expecting that developers will respond to present market conditions by launching more projects this year. A record high 25,187 condominium apartments were resold in the GTA in 2016, up 22 per cent year-over-year and representing a high of 26 per cent of all GTA resales last year. Sales of resale units in the fourth quarter climbed 26 per cent compared to same period one year before, while total listings in Q4 dropped 14 per cent year-over-year. This caused the sales-to-listings ratio to hit a record 80 per cent in the fourth quarter, up from 55 per cent from the year before, which led prices to grow 16 per cent annually. With an average unit size of 861 square feet, the average resale price of a condo unit reached $458,000, or $532 per square foot. 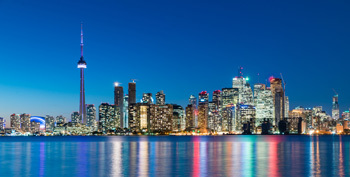 For the first time, the majority, or 59 per cent, of condo apartments represented the majority of all resale activity in the GTA below the $500,000 price point.